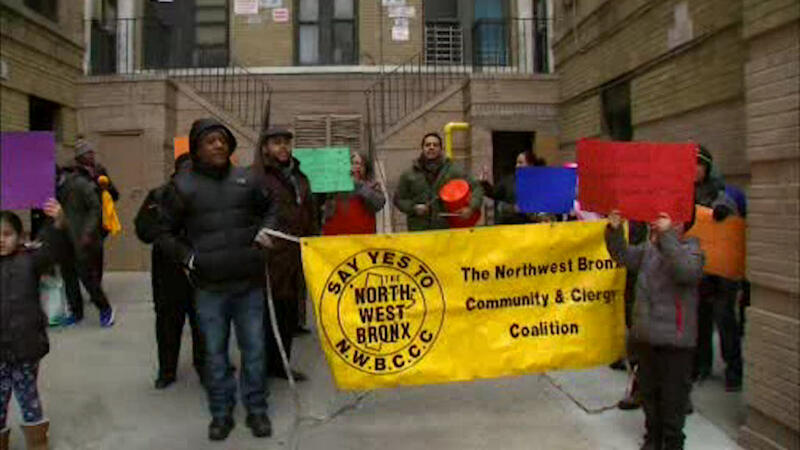 Bronx residents rally to get landlord to turn on gas - after 18 months! UNIVERSITY HEIGHTS, Bronx (WABC) -- Residents of a building in the Bronx are fuming mad as they've had to live without gas for the past 18 months. People who live at 2200 Aqueduct Avenue in University Heights rallied Tuesday night to demand their landlord fix the problem. They say most residents can't use their stoves and have no heat. Some gas lines were turned on in October, but many apartments are still out in the cold. "We have children who are sleeping with their hoodies, scarves, sweaters, sweats, so they can stay warm over the winter," said Assem. Victor Pichardo, (D) New York. "I bought some electronic devices that help me, but basically the only food that we can eat is rice and vegetables or sometimes we go to restaurants," a resident said. Eyewitness News reached out to their landlord for comment, but have not heard back.